While a church hosting such a meal might seem odd, I believe it is an important expression of Jesus’ practice of an open table. 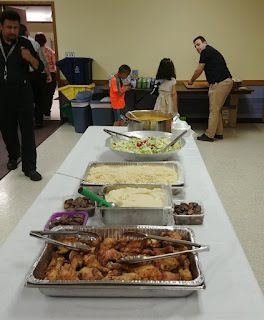 In this case we provided the space, TASM provided the meal. Together we shared fellowship, building important relationships. Christians and Muslims, along with Jews, form the Abrahamic faiths. All three traditions trace their roots to Abraham, with Christianity explicitly tracing its roots through Judaism. Islam traces its roots to Abraham through Ishmael, rather than through Isaac, but all three share common elements. All three have significant differences. The point of the meal was not to iron out our differences, but rather to build relationships. In the course of conversation, we can learn about each other’s faiths, with no expectation that the other will move to our way of thinking. Those kinds of conversations are legitimate, but that’s not the purpose here. 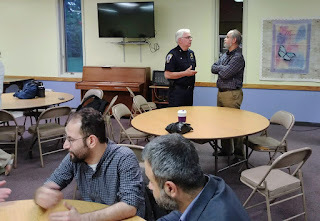 I should note that TASM is part of a larger movement that was founded by Fethullah Gülen and is dedicated to education and service (it is known by the name Hizmet, which is Turkish for service). Mr. Gülen lives in exile in the United States, and his movement has been targeted by the current Turkish President (President Erdogan accuses the movement of fomenting the coup attempt). Thus, my friends from TASM are considered terrorists in their home country. Many of them have family members who are in prison or at the very least have lost their jobs. I feel a sense of solidarity with my friends. I can vouch for them—they are not terrorists! Nor, as some critics suggest, seem cultish. In my mind, these are good people who seek to be of service in the world, and who have become scapegoats used by an autocratic ruler, who will brook no critics.I should note that Erdogan's regime has arrested a Christian missionary, accused him of being in league with this movement and the Kurds, and seeks to trade him for Mr. Gülen. So, keep in prayers Pastor Andrew Brunson. May our government not give in, and may he be freed (along with the many in Turkish prisons). Back to the dinners. Besides the great food (who doesn’t like baklava? ), the conversation leads to friendships, which leads to new understanding, which overcomes fear and suspicion (something that is greatly needed today). It helps build bridges between communities that are different in many ways. It is as Brene Brown has written: “What if what we experience close up is real, and what we hear on the news and from the mouths of politicians who are jockeying for power needs to be questioned? It is not easy to hate people close up.” [Braving the Wilderness, (Random House Publishing Group), p. 65. Kindle Edition.]. Indeed, it is not easy to help you have come to know as human beings who love their families and want to be the best persons they can be. I want to add that this meal is an expression of our understanding of what it means to be a missional congregation. With that in mind we not only invited members of the congregation, but the broader community. With that in mind I invited several community leaders to join us. Not everyone could come—life gets busy this time of year—but we were blessed to have the Troy Chief of Police, Gary Mayer, who is a friend (I am a chaplain with the department) and Ellen Hoderek, a member of the Troy City Council (also a friend). Having them present made this an even more blessed event. All in all, it was a wonderful night, and I’m hoping we can do it again next year!